Originally posted on CIFOR’s Forests News. 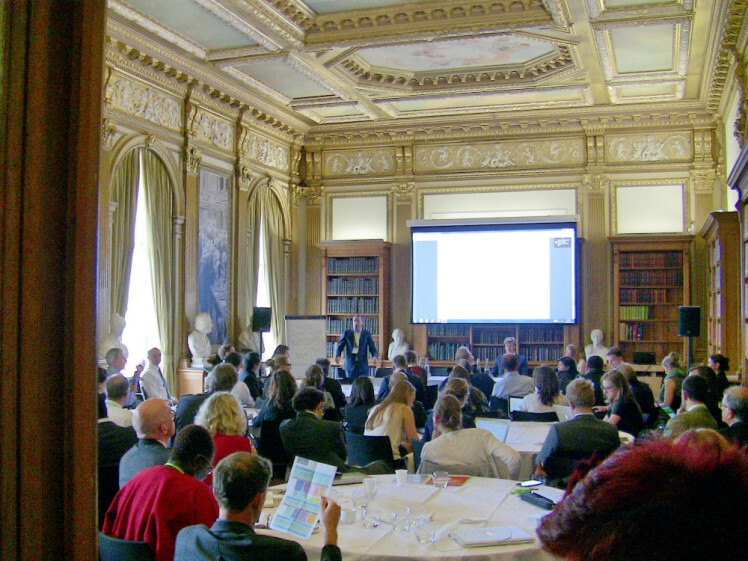 LONDON, England: There was standing room only at several of the sessions of the Global Landscapes Forum: The Investment Case event held here on June 10. As investment bankers and fund managers rubbed shoulders with agriculture and forestry researchers, representatives from advocacy groups and government agencies, there was a sense that momentum is growing to connect the flows of available capital with the needs of local communities, businesses and governments to achieve sustainable land use in developing countries. Many participants linked the engaging mood to this year’s intersection between international efforts to set sustainable development goals for the next 15 years and to find a global agreement to fight climate change. “A very significant part of the solution can be found through providing fair, affordable, long-term capital to smallholder farmers,” said Peter Holmgren, director general of Center for International Forestry Research (CIFOR) – one of the event’s coordinating partners. “From a financial, broader development and public good perspective, this seems to make sense. We need to explain what needs to be done without killing the idea with high transaction costs,” he added. Having some of the world’s largest investment banks and agricultural commodities buyers display their commitment to sustainable land use at the Global Landscapes Forum and other events is a welcome first step; delivering on those pledges in a verifiable way is another story. James Cameron, the chairman of the UK’s Overseas Development Institute and an investor in sustainable farming in Tanzania himself, said in his keynote address that much depended on all participants’ ability to find a common language to conduct transformation. “The skeptical, amoral, care-less investors need language that can resonate with them too, that does get put up on a chart, communicated to a colleague in another section of the business and made comparable just because of the numbers,” Cameron added. To illustrate the work remaining to be done to find such common ground, he noted that the International Panel on Climate Change’s“business as usual scenario” implied a 50 percent chance of temperatures rising by 7°C in the next century, which would ruin human civilization. Charles Darwin stood among the busts of famous British scientists lining the forum’s venue at the London Royal Society. The man who theorized the evolution and extinction of species, looked on as the participants discussed ways to channel capital into the transformation of land allocation that may save mankind. Sessions ranged from the design of new financial instruments, to risk management – including that associated with poor land tenure rights, and ways to provide insurance against risks specific to such investments. Some of the liveliest discussions took place at a packed debate on the palm oil industry’s efforts to move away from deforestation. Gaps emerged on several occasions despite the perceived abundance of needs on the ground and of capital – especially at a time when more traditional forms of investment have lost their luster amid low global interest rates. It may be romantic to see a half-fed ox pulling a 50cm piece of wood in the countryside: that’s a poverty story that won’t go away if we don’t make it go away. Daniel Gad, a commercial farmer in Ethiopia, insisted that the onus was on investors to take their money to those who need it most. “It may be romantic to see a half-fed ox pulling a 50cm piece of wood in the countryside: that’s a poverty story that won’t go away if we don’t make it go away. The farmer has no capability, no access to finance, no collateral, no education or health benefits to make that change,” Gad said. Yet he added that he kept meeting financiers who told him they did not know where to put their capital. “I don’t get it. The projects are there. We shouldn’t even be sitting here talking about it. The amount of projects that are credible, bankable projects, sitting in the area that I’m in!” Gad exclaimed. Sean Kidney, chief executive of the Climate Bonds Initiative replied that it took time to change the perception and risk appreciation of such projects. “We might think your deal in Ethiopia is fantastic, but it might take my pension fund two years to deduce that idea. So what do we do? We need some demonstration issuance and guarantees,” Kidney said. He called on financial agencies backed by donor countries, such as Germany’s KfW Bank, to “come and guarantee some of these projects and get some bonds out there in the market to familiarize investors with them – then we need a 3-5 year strategy to withdraw those supports” and let a long-term market develop. Other solutions came from Leslie L. Durschinger, the founder and managing director of the climate change and land use consultancy and asset management firm Terra Global. She offered a top-10 list of considerations for sustainable landscape finance, including a call to “engage directly with the private sector, not through typical agencies” – including extractive industries, which have stronger financial power than the forestry sector typically targeted by the promoters of sustainable landscapes. Durschinger also warned that “not all interventions are financeable with private sector money”. Public donors are still needed to fund those projects and to back other financial instruments to reduce risk, she said. Yet the permanent value of ecosystem services could soon replace government guarantees according to Mark Burrows , vice chairman of global investment banking at Credit Suisse. “In the environment, the asset doesn’t disappear. It is there forever,” he said. Just like sovereign states generally re-issue debt regularly to fund themselves, Burrows said sustainable landscapes could ultimately become the collateral for the investment they need. “If we understand, and get the financiers to understand that someone will come in at the end of the 10 or 15 years and be the other person that refinances that dead instrument, you will solve the problem,” he said. Previous SBSTA: after almost 10 years is the REDD+ Framework finally complete ?